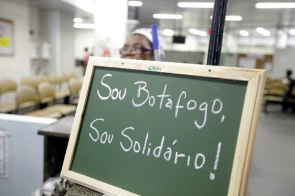 Botafogo during a campaign of blood donation Star Partnership, which involves attendance at the Institute Hemorio. 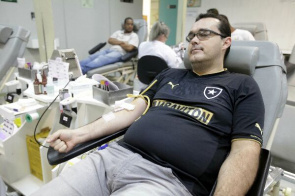 Botafogo fans participate in this Thursday (26), the 5th edition of the Star Solidarity Campaign, which involves attendance at the Institute Hemorio to donate blood. It is expected that at least 300 alvinegros collaborate to increase the blood supply of the entity, which for over three weeks is at critical levels. The action has a lot of official products of the club for those who attend. The initiative came from a group of young fans. Tatiana de Biasi, one of the creators of the campaign, explains that it is important that the other teams also carry out this type of action to help meet the blood supply of the Hemorio. "Football is a national passion, and we have to take that love for the club to something larger, creating a network of solidarity. It is very important that the other teams also encourage its supporters to do the same," he suggested. If the volunteer can not donate blood, to attend anyway, taking a can of milk powder, which will be donated to the Foundation Pro-Hemorio, which supports the Food Support Project for children between 0 and 2 years with sickle cell disease. The Hemorio is the coordinating center of Rio de Janeiro, which supplies blood and blood products to approximately 180 public health units, distributed throughout the state. For more information, the volunteer can call the Dial by Blood 0800 282 0708.